Are you looking to tow a caravan or trailer? If so, you’ll first need to equip your car with a towbar. Here at the Towbar Company, we’re regarded as the number one choice for towbar fitting. Bournemouth residents have benefitted from our skills, expertise and unbeatable prices for many years. To find out more, call us today on 07778 343464. Caravan holidays have always proved highly popular, and this hasn’t changed much over the years. Of course, if you own a caravan, you’ll need a way of towing it and the same can be said for a trailer too. 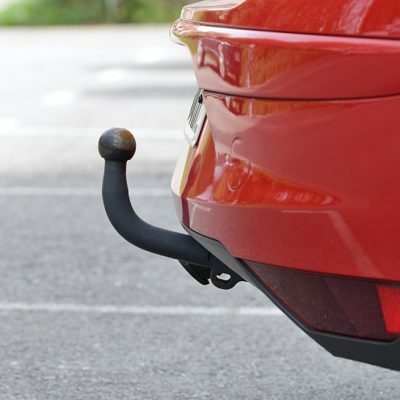 The majority of vehicles are capable of performing this role, but most don’t come fitted with towbars as standard. Fortunately, our company are renowned for being the most affordable choice for towbar fitting, Bournemouth has to offer. Our expertise encompasses a wide range of towbars, and we cover both fixed and detachable variants. We offer a mobile service that covers both, so should you find yourself in need of having a towbar fitted, we’ll come to you. We’ve been providing Bournemouth towbar fitting services in this manner for many years and are the go-to choice for most customers. What Can Our Towbar Fitting Bournemouth Specialists Do for You? Regardless of what you intend to tow, our expert team is sure to have you covered. We’ll discuss your requirements over the phone and arrange a convenient time to come to you. Upon arrival, we’ll take a look at your vehicle and what it is you intend to tow. We quote for the work that is required, and there is no obligation to proceed with using our company for towbar fitting in Bournemouth. For modern vehicles, we even go so far as to use the very latest state-of-the-art dedicated wiring kits. This enables us to wire up your towbar in a way that communicates directly with the managing systems of your vehicle. This is done in-line with the manufacturer’s specifications. It’s this attention to detail which makes us the best choice for towbar fitting Bournemouth has seen. If you’re in the market for wiring kits with the intention of hooking a car up to a trailer or caravan, you’re in luck. Here at the Towbar Company, we supply a wide range of wiring kits with vehicle specific and universal options available. We normally suggest a vehicle-specific one, however, to avoid any potential issues. It’s always wise to purchase a wiring kit when requesting towbar fitting. Bournemouth customers can benefit from a wide range of features when the right type of connector is used. Features include constant power (required for caravans), fog light deactivation, trailer stabilisation, adaptive cruise control, lamp substitution and more. As well as being the leading choice for towbar fitting, Bournemouth residents can also come to us to purchase those all-important accessories. From Bluetooth phone kits and GPS tracking systems to rear parking sensors and towbar accessories, we stock everything you need to enhance your driving experience. Why Choose the Towbar Company? The Towbar Company are a company manned by fitters with more than 25 years of experience in the industry. Exceptional workmanship, quality products and affordable prices are the three things that matter most to us. Knowing that we’re providing the best possible service to our clients is important to us, and this is the reason you should choose us for towbar fitting in Bournemouth. Thanks to our mobile Bournemouth towbar fitting service, we’ll come to you wherever you happen to be. This means that you can get on with the rest of your day uninterrupted. We work quickly and efficiently to minimise any downtime, and our fully trained and accredited team assure you of market-leading results. All our work is fully insured and compliant with the manufacturer’s specifications. This is great news as you won’t have to worry about your vehicle’s warranty being rendered void by having a towbar fitted. So, if you’re based in or around the Bournemouth, Southampton, Andover or Salisbury area, give us call on the number below. Contact the Towbar Company today on 07778 343464 and see how we can help with a towbar fitting. Bournemouth customers can also check out our testimonials to see what others have had to say about us. I have read and accept the and consent to The Towbar Company contacting me about my enquiry.